Bruce Boccard died Thurs. (9 July 87) Ashes already spread over Soda Mtn. Petition: We, the undersigned, respectfully request the geographic names Board to designate a currently unnamed geographic feature (the southern point of the ridge, one mile southwest of Soda Mtn in the NW quarter of section 33, Township 40 south, Range 3 east of the Willamette meridian, elevation 5,730 feet) as Boccard Point. 3/10/2019: Bruce was a dear friend and first chair of the Soda Mountain Wilderness Council. 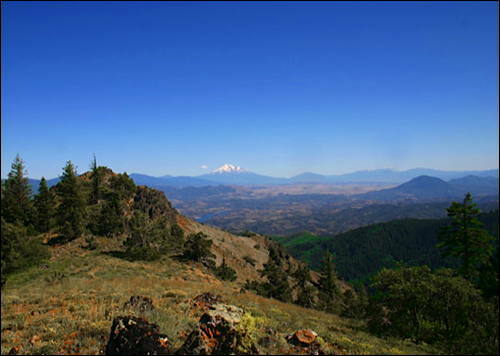 I was a board member for a spell, and for years worked with this organization to get the Soda Mountain area designated as Cascade-Siskiyou National Monument. This happened on June 9, 2000. The photo shows Boccard Point in the foreground, looking south toward Mount Shasta.